Brevard Art News: The Zodiac Lounge Event combines music, entertainment and art... Don't miss it. The Zodiac Lounge Event combines music, entertainment and art... Don't miss it. EAU GALLIE and MELBOURNE, February, 4, 2014 — Artist and vintage culture enthusiast Stephen Lomazzo and writer and poet Joe Snyder will hold their first Zodiac Lounge Event on March 14, 2014, at the Eau Gallie Civic Center in Eau Gallie, Florida. With the help of several local sponsors, the event re-creates for one night the chic-party atmosphere of a mid-1950s cocktail lounge, complete with authentic live musical performances and entertainment, including variety, cabaret and burlesque-style acts, as well as vintage furniture, art, cars, contests, raffles, food, cocktails and more. The Zodiac Lounge event will transport guests to the sights and sounds of an upscale nightclub right out of the 1950s. Find a snazzy costume, grab your friends and your best guy or girl and swing on down to Brevard’s largest vintage culture event of the year! 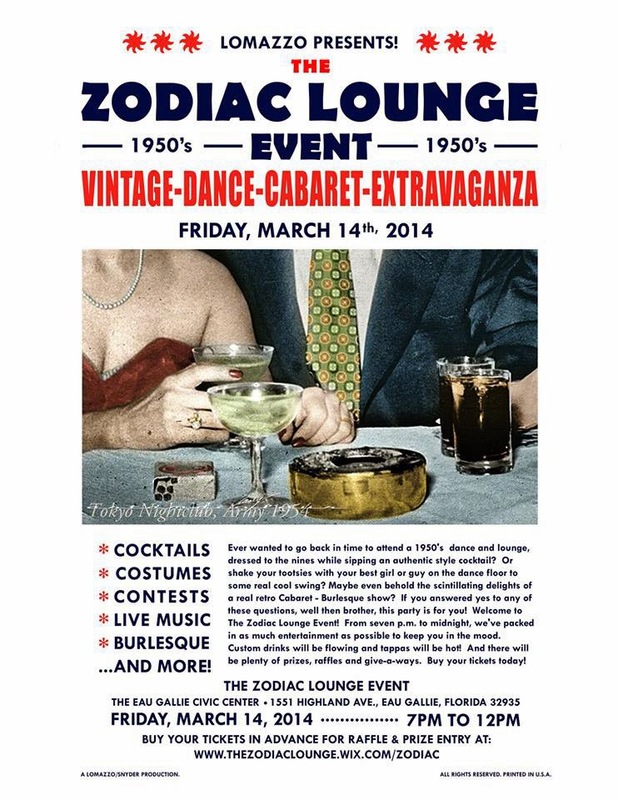 Inspired by the legend of the “Zodiac Lounge,” an Eau Gallie nightclub which is said, according to our fanciful sources, to have burnt down in 1957, Stephen Lomazzo and Joe Snyder have resurrected its memory and are bringing the Zodiac back from the ashes of time for just one night, March 14, 2014. In conjunction with the Zodiac Lounge Event, the Renee Foosaner Educational Center of the Foosaner Art Museum, Florida Institute of Technology, will host the art display portion of the event one week prior, with a reception to coincide with the EGAD First Friday. The Foosaner Educational Center also will host the pre-party and after-party the day of the event. With a wide array of local performers and acts including: Master musician and saxophonist Steve Mazzi, vocalist Margaret Cross, The Blast-Offs!, and magician/comedian Todd Bogue just to name a few, other sponsors and contributors include: The Eau Gallie Arts District Main Street, Rocket City Retro MCM Furniture and Design, One Love Salon and Spa, Studio Z by Crystal, Foo Bar, Thee House of Yoga, DaVinci’s Computer Corp., Jen Tyler Photography, Polercise Studio, Petals Florist, The Boudoir Bombshells. The official Zodiac Lounge Event will take place at the Eau Gallie Civic Center (1551 Highland Avenue, Eau Gallie, FL 32935) on Friday, March 14, 2014. Hours for the event are 7 p.m. to midnight. Tickets are available and can be purchased online at: www.thezodiaclounge.wix.com/zodiac. This is a 21 and over event. Advance tickets are $20.00. Purchase through the website enters you in the all the prize and raffle drawings. The Zodiac Lounge Event Art Exhibit will take place at the Renee Foosaner Educational Center (Highland Avenue, Eau Gallie, FL 32935) on Friday, March 7, 2014. Hours for the exhibit are 5 p.m. to 9 p.m. Tickets for the Zodiac Lounge Event will be available there in person. –and- Friday, March 14, 2014 from 6 p.m. to 7 p.m./12 p.m. to ? For more information, visit www.thezodiaclounge.wix.com/zodiac or call 321-684-9126.